We have finally completed this awesome interior basement. The homeowners were happy with the paint and asked us to continue to work on the upstairs portion of the home. 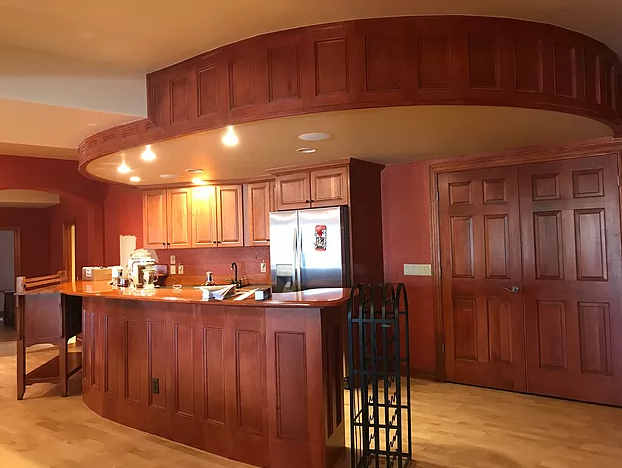 As you can see through the before and after pictures, we were able to update the space and accentuate the impressive cherry wood bar and cherry stained woodwork throughout the basement. In order for us to stay efficient in this home and meet our deadline, we used 18″ Purdy roller covers for the larger portion of the walls and 9″ Purdy rollers for some of the smaller spaces. As with all of our projects, we painted 2 coat to ensure complete coverage over the bright colors used on the walls. This also helps with even sheen consistency which is important for future touch ups and final appearance. On our next “Behind the Brush” series, we will be looking into a small exterior paint job where the paint is coming off in sheets! Like the project? Like us on Facebook, Linkedin or follow us on Instagram. Service Areas: Castle Rock, Parker, Highlands Ranch, Lone Tree, Littleton | ©2018 Barco's Painting of Colorado - Do not copy. All rights reserved.